Dale Chihuly has a huge international fan club that appreciates his unique striking glass works. To many outside the United States, Chihuly is considered the most famous living American artist of any genre. Yet, as an artist, Chihuly prompts discussions among the cognoscenti regarding craft versus art, the propriety of Chihuly’s self-promotion, the implications of his recreating pieces for private commissions and the legitimacy of his working collaboratively with a team. But viewing the de Young’s vibrant and dazzling show of Chihuly’s oeuvre reduces that discussion to an intellectual afterthought. 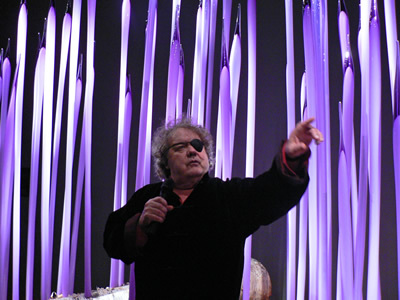 Contrary to those who would tssk-tssk at Chihuly, he is often commended for revolutionizing the studio glass movement by expanding its original premise of the solitary artist working in a studio environment to that of collaborative teams and a division of labor within the creative process. It is Chihuly’s development of the complex, multipart sculptures, some of which can be seen at the de Young, that lift his work out of the traditional craft category and move them into the sphere of large-scale contemporary sculpture. Without the use of “Team Chihuly,” it is unlikely that these room-sized installations, which each consist of hundreds of individual glass sculptures, could have been created. Chihuly at the de Young consists of eleven galleries, each containing a different aspect of Chihuly’s creative periods, from drawings, to single vessels, to large architectural installations. They illustrate well the development of Chihuly’s techniques and artistry. The first gallery contains a recreation of the 1972 Glass Forest #3, a large and graceful display of white milk-glass and neon. The final gallery holds the 2003 56-foot-long Mille Fiori garden of glass. Oddly incongruous with the razzle-dazzle of Chihuly’s glass, are collections of his Pendleton blankets and Native American art baskets. The inclusion of the Tabac Basket, glass baskets that were inspired by the Native American baskets did not seem to make the display of these collections more appropriate. The large, high ceilinged space at the de Young’s new museum is a perfect backdrop for this ambitious exhibit. The lighting and layout are dramatic. The show is designed so that viewers wander into a new gallery only by turning a corner. Thus, each new room is a surprise. ©Emily S. Mendel 2008. All Rights Reserved.